The breakfast room at our current B and B is quite something – among other things, it contains a family of giant bears occupying a wicker seat and an oak table the size of our kitchen. Yesterday’s ill weather seems to have gone and, apart from the odd fierce but brief shower, we are hopeful of better weather. The breakfast spread is huge and our landlady has gone to some lengths to dry off our wet outdoor gear from yesterday. We say our farewells and leave her and her domestic staff to get on with their day. Today’s walk, due to the importance of shoehorning the preceding stages into a manageable length, is not very long and promises from the perspective of this doorstep to be very enjoyable. It’s quite a short walk back to the path and we are glad to be on our way, pointing our faces in the direction of Lands End which we are due to arrive at the day after next. We’re straight back in mining country with some spectacular ruins for us to walk through, presumably of an engine house. 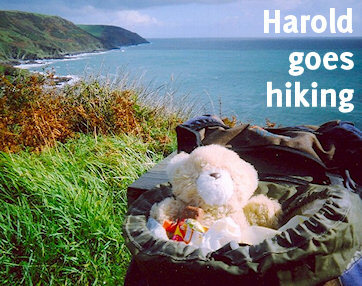 Although it is not very far to Cape Cornwall, this is fairly dramatic walking in an area we haven’t really seen before – more deep valleys with lush sub-tropical vegetation. After dropping right down to sea level at Porth Ledden we have to walk quite a way up a little valley to cross a bridge over the usual little stream. There are some signs that this was once in cultivation, and there are donkeys in a field. A big climb back up to the clifftop, and Cape Cornwall is in sight. Usually on these walks you don’t want to deviate a step from the path in case you incur a morsel of extra effort for yourself. But Cape Cornwall is an exception – perhaps one of our favourite places in the county – and we aren’t going to settle for just cutting across its neck. Since we were last here it has been bought for the nation by Heinz and there are some prominent signs telling us so. A welcome change is that you can now visit the little ruined chapel at the bottom. Next to it is a fairly recent grave – of someone who had seen out their threescore years and ten – and we wonder what the story of the sale was, and whether it was connected. There are also a couple more, oddly disturbing; a dead pet with its lead and a small child’s with some of its toys and a statue of the Buddha. At the Cape itself we are offered a choice of paths, steep or gentle. Not for nothing have we walked 85 miles in a week, and we charge up the steep one. And it is steep. At the top we sit down for a snack and contemplate for a bit – a little glimpse of that far-west mystical Cornwall is just visible now if you don’t look straight at it. An abrupt shower soon puts paid to that, however. Coming in from the sea, it sends other people scurrying down. We just pull on our waterproofs. But it probably is time to be moving on. There are a number of houses – an unexpected amount – and even a number of boats drawn up in the little cove. Possibly even a token surfer or two. There is something that looks like the remains of a terraced garden now full of that fleshy cliff-loving plant we seem to see everywhere. A stiff climb up a track worthy of Iceland for unevenness and the path continues along the cliff top to Sennen and Lands End. We pass some more mining relics and some excitable day walkers who positively squeal when told we have come all the way from Padstow. At Porth Nanven is another dip to sea level along another lush valley – called Cot Valley, we later learn. Again, it is hard to picture this sunny green spot alongside some of the bleak views from the cliff top. We know we need to cross the little stream but think we have missed the crossing point. It is supposed to be at a car park but there are two and we end up hopping across on some slippery stones. This signified a clear change in the mood of the path and we head around Whitesand Bay towards Sennen Cove. It is a reasonably level clifftop walk and well justifies the SWCPA’s description as “one of the grandest parts of the path”. Andy’s attention is caught early on by mine adits in the cliffside. There are lovely views around the bay to Land’s End – in all, a perfect excuse for lunch which we eat on a handy stone bench set back from the cliff which looks just too good to resist. We sit there munching energy bars for perhaps an hour before pressing on to Sennen. The terrain is rocky and retains the West Penwith moorland quality that we have come to associate with the path since St Ives but the vegetation reflects the fact that we are nearly as far south as it is possible to be. There are a few steep climbs and the path has a curious habit of completely disappearing – in one case leaving us with a near-vertical scramble of around 20 feet. We also meet several people along the way – Andy gets stuck in conversation with a couple who dislike this section of the path because it’s not possible to put in epic mileages. This raises lots of interesting questions about why people walk and why it is that some walkers find other walkers a challenge just by their very existence. Also there are a lot of casual day walkers including one posh chap who says “you look terribly earnest”. All different ways that people have of guarding their own self image. Gradually, as we near Whitesands Bay, the scenery gets less lush, more coastal, and much rockier. The path descends to beach level at the back of the bay and there are carpets of that fleshy green plant we have been seeing all along the path. The recommended route is a climb up to the clifftops but, despite knowing it is touch and go with the tides, we decide to cut across the beach and scramble over rocks as we did so successfully earlier in the walk. This, of course, is a bloody stupid thing to do for two reasons. One – unbeknownst to us – the quickest route to Whitesands Lodge is to cut inland at this point, up the cliff, and not walk on to Sennen itself. And two, although the scramble across rocks looks easy, it isn’t and we end up wet to the knees with soaked boots and the sort of foul tempers that come from knowing you’ve done something stupid and should be glad to have got off that lightly. This, although we don’t yet know it, is effectively the end of the walk for this year. We strip off our wet boots and socks, roll our trousers to our knees and trudge along the beach towards the village. Andy phones Whitesands Lodge for directions and gets the bad news about its location. The woman who takes the call catches the edge of his temper – he later apologises profusely – and agrees to drive out to pick us up. We stand waiting, feeling like a pair of absolute idiots, with Andy already starting to feel guilty about his tantrum on the phone. It doesn’t bode terribly well – but Whitesands Lodge is a revelation, eventually. It’s a backpackers’/surfers’ hostel that gives the entirely false impression no-one over 35 ever steps inside. At first it looks unpromising – music from the kitchens pounds through the floor of our room. It’s more than disappointing as everything so far had looked good. But the longer we are there, the more we come to like it. Our room has a pleasant hippyish feel about it and is also very comfortable. The cafe also has a nice feeling to it and a good vegetarian menu although Andy felt the main courses were a bit dry (felafel tortillas annd a cashew nut burger). Lisa had toothache and therefore does not feel qualified to comment. The meal is the end of a couple of frankly ropey hours and is finished off with a pair of huge frothy hot chocolates, after which we go to the building’s ‘quiet room’ and write up lots of this diary. We have also heard the last of any disturbance, and the evening ends well. But we have read the weather forecast for the next day and it is not at all good. We go to bed knowing the next stage of the walk is in the lap of the Gods. Andy has a good look at the visitors’ book and has fits of laughter at all the ‘love and peace’ messages left by middle-aged women, but despite this we both feel there’s something a bit special to the atmosphere here. Start: 11am; lunch: 4.55pm; end: 6pm; time on path: 6 hours.